Magpie ducks are hardy foragers who can bring variety to your barnyard or backyard pond with their distinct black-and-white plumage. Known for gourmet meat, prolific egg production and general hardiness, magpie ducks provide a wide range of benefits for the backyard breeder. Male magpies are relatively lightweight domesticated ducks, usually achieving weights of six pounds or less. Magpie ducks from American bloodlines tend to be a pound or two lighter, with males averaging four to five pounds. Although light, they are incapable of sustained flight, but can flap and leap several feet in the air. The ducks' long necks help them reach deep into vegetation to forage for bugs. Males can stand nearly erect, similar to Indian runner ducks..
Named after the common black and white bird, magpie ducks' bold black and white coloration vaguely resembles the black hood and saddle of the bird species. Magpie drakes have white bodies with black on the wings and sides of the body back to the tail, as well as black "caps" on top of their heads. Black speckles sometimes extend onto their feet and beaks, which can be orange or yellow and turn bluish-green with age. Magpie ducklings show no discernible difference between the sexes until they mature. The ducklings are yellow, with black downy "caps," and dark coloration along their wings and sides of the body. 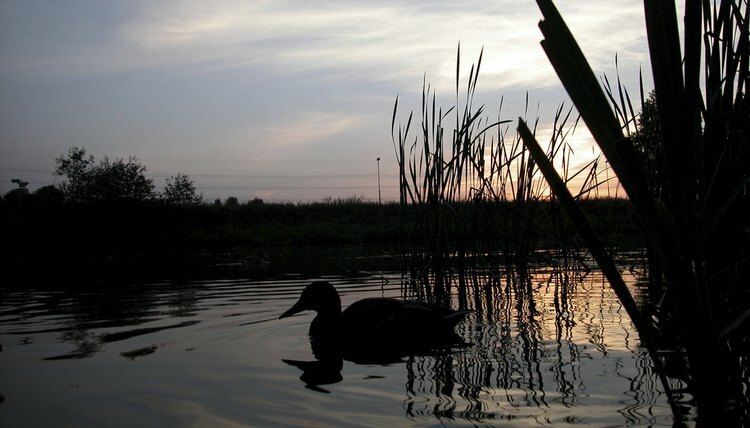 The patches of black down will be replaced by black feathers, so if you are planning to show your duckling, you can easily discern a suitable pattern for the show ring as soon as ducks hatch. Ducklings will have orange or yellow beaks and feet. At first glance, males and females of the species look very similar. Males have a telltale curled feather just in front of the tail, and feathers on the neck, chest and wings are more iridescent in full sunlight. Males have a high libido, so it is ideal to keep 3 to 5 females for each male magpie in your flock. Females will lay up to nearly 300 eggs per year, and will brood and rear the next generation.